At the National NRM Regions Knowledge Conference, I presented on measuring community engagement and social capacity. 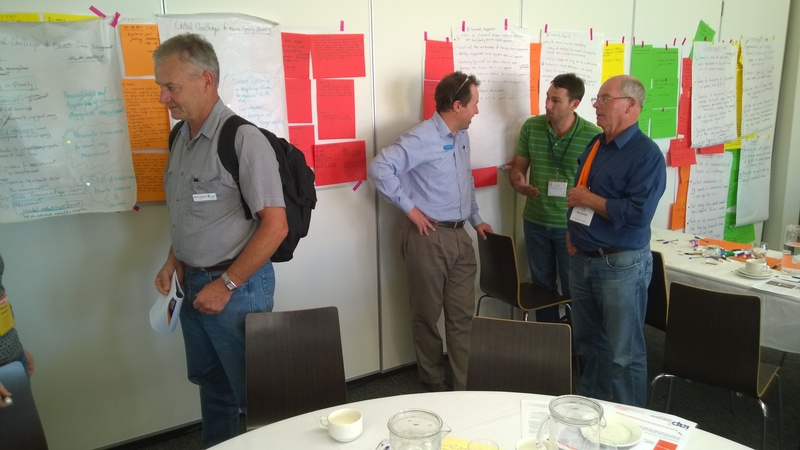 We had 66 people in the room who wanted to talk about measuring the social, and amongst them, a sprinkling of old hands (more than 10 years in NRM engagement), senior managers of NRM regional bodies, and even a couple of social researchers! It was an opportunity to dig out past work, in particular, the 2005-06 Community Strategies project, which developed a model for regional community strategies and trialled a methodology for measuring and setting targets for social capacity in NRM. I’d taken a pragmatic approach, looking for indicators that would make sense to regional natural resource managers, and measures with simple data gathering. I had trialled these with the Corangamite CMA and some of them worked really well. At the time, when I toured the results around the State, I found little appetite to use or further develop the measures. I was disappointed, and surprised, and put the lack of uptake down in part to my not having built stronger relationships with regional managers during the process. They hadn’t known enough about what I was doing, what was coming and hadn’t had a strong role in scoping the project. Hearing about what others were doing right now around Australia, the work stands up well, and that there are aspects that could be picked up and used now. My stand out measure, which I’ve used with NRM teams since, is a method for measuring the strength of the working relationships between CMAs and their stakeholders. Listening to where regions are at now with measuring CE/CB, I got at a more balanced understanding of why there hadn’t been uptake of the previous project. At the time, Catchment Management Authorities had a lot on their plate setting up systems to assess and monitor biophysical assets. They didn’t want another asset (the social) to add to their load. The Community Strategies project was a little ahead of the curve. I think they are still cautious about having the social asset as another reportable in their responsibilities. However, they have a lot more in place for monitoring the biophysical, and there’s more space to think about the social. Politicians’ interest in engagement at local community level is sharpening attention not just on engaging communities, but on measuring that engagement and its impacts. Regional bodies know they need a compelling story for politicians, and numbers are part of that.